The XODULAR ecoSYSTEM is a new modular synthesizer system in Pure Data. Where the first XODULAR system was a collection of simpler synthesis building blocks, the ecoSYSTEM is a much more personal instrument. The modules are more specific and complex. I wanted to create an instrument with a unique workflow and sound. For this reason, I do suspect that it might not be as easy to dive straight into as the previous XODULAR system, but the sonic possibilities are much, much wider. I hope you have some fun with it! I would also like to thank Joseph Beg for helping me realizing this project. His beta-testing helped shape this thing immensely. 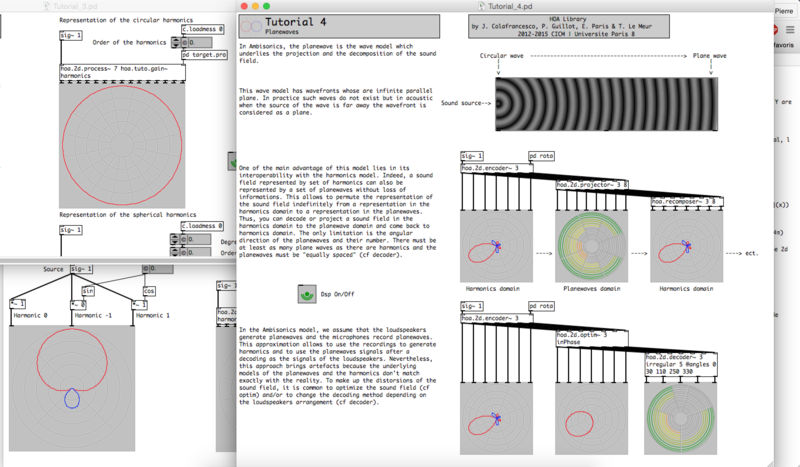 Hoa library as a suite of objects and patchs for PureData software. Important : It is recommended to install the Cream library that is used in the help files. 1 - Download the last releases. 2 - Put the "Cream" and the "Hoa" folders in one of the folders for the Pure Data libraries ("/Users/Username/Library/Pd", "/Library/Pd" or the "extra" folder in the Pure Data distribution). For Vanilla : add "Cream" and "Hoa" with the button "add..." in the startup window (Pd -> Preference... -> Startup...). For Extended : add "-lib Cream -lib Hoa" in the startup option of the property window. 4 - Close and restart Pure Data. Ps : We recommend to use Vanilla. A patch for the SN3D implementation et la compatibility with the ambiX format is available. Windows / Mac / Linux (v2.2) (25/06/2015). Feedback and comments are welcome. Contacts. All sources codes are available on the HoaLibrary Github repository. The hoa.library in under the GNU Public License. If you’d like to avoid the restrictions of the GPL and use Hoa Library for a closed-source product, you contact the CICM. Work in progress: This part of the documentation is still in draft form but do not hesitate to ask questions and propose changes. The use of audio only requires to define the supported configuration of audio channels. However, many options and properties can be implemented and used to adapt the audio processing to the audio context and to offer more flexibility. Important: The plugin should not be MIDI only. Ensure that the entry midionly is not defined or false (midionly false). An audio bus is a channels configuration and corresponds to a number of input audio channels associated to a number of output audio channels. 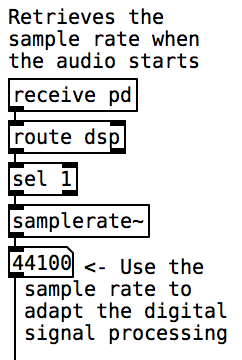 To support an audio bus, add the entry busfollowed by the number of input audio channels and the number of output audio channels in the properties file of the plugin. For example, adding the entry bus 2 2 enables the support for an audio channels configuration with two inputs associated to two outputs. 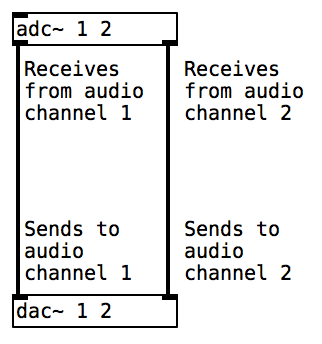 In the patch, use the objects [adc~] and [dac~]with the standard syntax of arguments to receive and to send the audio signals. When no input channel is necessary, for a synthesizer for example, using the entry bus 0 2enables the support for an audio channels configuration with only two outputs. Or when only an input channel is necessary, for a volume unit meter for example, using the entry bus 1 0enables the support for an audio channels configuration with only one output. In theory, a plugin accepts any number of input audio channels and any number of output audio channels, but in practice, most of the digital audio workstations highly restrict the possible configurations. Refer to the documentation of your digital audio workstation to see what are the available configurations. The digital audio workstation controls the sample rate of the audio chain. When the sample rate changes, the plugin stops the audio processing, changes the internal sample rate of Pd and restarts the audio processing. If the processing requires adaptation to the sample rate, for example when using FFT, in the patch, use the audio start notification to retrieve the running sample rate in order to adapt the audio processing. The digital audio workstation controls the size of the audio block, the number of samples per audio block, of the audio chain. Although the size of the audio block can be set in the preferences of the digital audio workstation, the number of samples per audio block is not guaranteed and may vary with each block. In addition, Pd internally requires that the block size be 64 samples but the plugin manages the proper operation of both systems - using a default latency of 64 samples but which is compensated by the digital audio workstation. In the main patch, the size of the audio block will always be 64 samples but it is still possible to use a larger or smaller block size in the abstractions and sub-patches using the object [block~]. Audio processing may involve latency, for example when using FFT, but digital audio workstations offer a system to compensate for this artifact. As this latency can change for many reason, for example when the sample rate has changed, since version 1.0.4, the plugin offers a dynamic system for notifying the digital audio workstation. 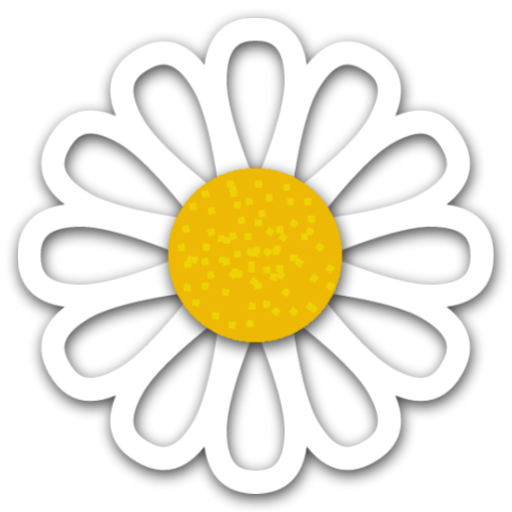 Thus to warn the digital audio workstation that the latency involved in the audio processing has changed, send the message [audio latency $1( with $1 replaced by the latency in samples to the plugin via the object [send camomile]. Audio processing may also involve an audio tail which should be taken into account by the digital audio workstations, for example when using delay lines. To define the audio tail length the plugin, use the entry taillength followed by the length in seconds in the properties file of the plugin. For example, if the tail length is 12.5 seconds, then add taillength 12.5. Important: Digital audio workstations do not support dynamic change of tail length. So always prefer a very long tail length that will suit all your needs. Users can bypass a plugin to preserve the incoming audio signals and the MIDI events. By default, the plugin manages this functionality and since the VST3 format, a default parameter is used to do so. When a plugin is bypassed, the DSP method of Pd is avoid and the incoming signals are preserved and the MIDI events are not consumed. But if the patch implies latency, bypassing the plugin will creates artifacts such as pre-echoes or time-shifting. Moreover, one could want to cross-fade the signals to avoid glitches and crackles for examples. 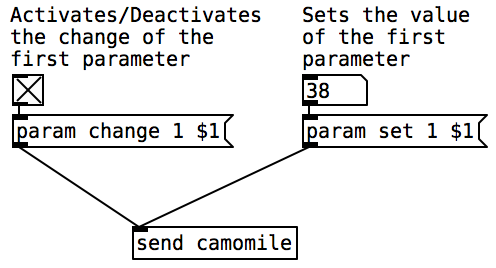 Thus, since v1.0.6, Camomile offers to override the bypass parameter to manually control the bypass mechanism within the patch. To override the default bypass parameter, set entry autobypass to false in the properties file of the plugin (autobypass false) and create manually new bypass parameter with the name Bypass or bypass, for example: param -name Bypass -list Off/On (see the parametersection for further information). In the patch, you can receive the bypass state by using the index of the parameter. Here is an example: patch. 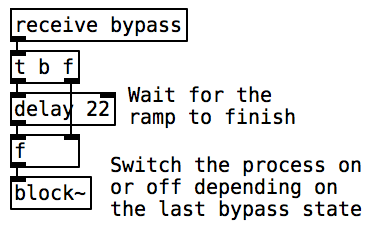 In this example, the manual bypass is used to make-up the latency of the plugin and to avoid from crackles: patch. At last, to avoid unnecessary computation, the sub-patches and abstractions can be switched off using the object [block~]. If you use one or the two previous mechanisms to switch between the wet and dry signals and to make-up the latency, they must still be active. So in the previous example, in the Effect sub-patch, you can use: patch. This feature is still experimental and the operation differs between plugin formats. Maybe the approach will change in the future to ensure more consistency. Some digital audio workstations also support an extra audio bus for side-chain processing. A side-chain corresponds to one or more extra channels that can be fed by an external input like another track. For example, a compressor with a side-chain input controls gain from main input to output based on the level of the signal at the side-chain input. 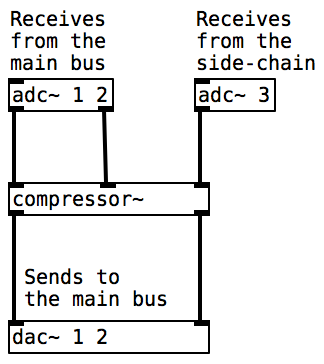 To support an extra audio bus for side-chain processing, add a second entry bus followed by the number of input audio channels and the number of output audio channels required by the side-chain in the properties file of the plugin. In the patch, use the objects [adc~] and [dac~]with the standard syntax of arguments to receive and to send the audio signals. The channels' numbers of the side-chain follow the channels' numbers of the main. In theory, a side-chain can correspond to any bus, but in practice, as for the main audio bus, the available configurations are restricted by the digital audio workstations. And keep in mind that even if side-chain processing is a common approach, all the digital audio workstations does not support this feature. Some digital audio workstations also well support multichannel processing and dynamic change of audio buses. By default, the MIDI support is disabled to avoid handling unnecessary information in order to optimize the plugin. To use MIDI events in the plugin, the MIDI input and/or the MIDI output must be enabled. If the plugin handles only MIDI event and no audio signal the plugin can also be optimized by disabling audio processing. MIDI support can be enabled regardless of whether the plugin is an effect or an instrument. To support input MIDI events, the properties file of the plugin must contains the entry midiin true (default is midiin false). In the patch, use the MIDI objects [notein], [ctlin], [bendin], [touchin], [polytouchin], [pgmin], [midiin], [sysexin] and [midirealtimein] with the standard syntax of arguments to receive MIDI events. The MIDI port of the objects [midiin], [sysexin] and [midirealtimein] doesn't seem to be supported by the digital audio workstation so their port numbers are always set to zero. Important: The objects [midiin], [sysexin] and [midirealtimein] have not been well tested yet. If you encounter any issue, feel free to report it. To support output MIDI events, the properties file of the plugin must contains the entry midiout true (default is midiout false). In the patch, use the MIDI objects [noteout], [ctlout], [bendout], [touchout], [polytouchout], [pgmout] and [midiout] with the standard syntax of arguments to send MIDI events. The MIDI port of the object [midiout] doesn't seem to be supported by the digital audio workstation so the port number is always set to zero. Important: The objects [midiout] has not been well tested yet. If you encounter any issue, feel free to report it. If the plugin doesn't process any audio signal, the audio processing can be bypassed using the entry midionly true in the properties file of the plugin (default is midionly false). This option optimizes the plugin and help the digital audio workstation to manage the audio chain. To support play head information, the properties file of the plugin must contains the entry playhead true (default is playhead false). In the patch, use the object [receive playhead] to retrieve the play head information. playing followed by one number: 1 is the transport is currently looping and otherwise 0.
recording followed by one number: 1 is the transport is currently recording and otherwise 0.
looping followed by three numbers: 1 is the transport is currently looping and otherwise 0, the start position of the loop in units of quarter-notes and the end position of the loop in units of quarter-notes. edittime followed by one number: the position of the start of the timeline is seconds. framerate followed by one number: the video frame rate, if applicable. bpm followed by one number: the tempo in beats per minute. lastbar followed by one number: the position of the start of the last bar, in units of quarter-notes. timesig followed by two numbers: the time signature numerator and the time signature denumerator. position followed by three numbers: the current play head position in units of quarter-notes from the start of the timeline, the current play head position in samples from the start of the timeline and the current play head position in seconds from the start of the timeline. This section covers the various methods to control the data related to the plugin status. These methods include the management of parameters, the data that can be modified in real time, and programs, the presets grouping the status of several parameters as well as additional meta-data. A parameter represents an aspect of the plugin engine with a number, such as the frequency of a ring modulation for example. 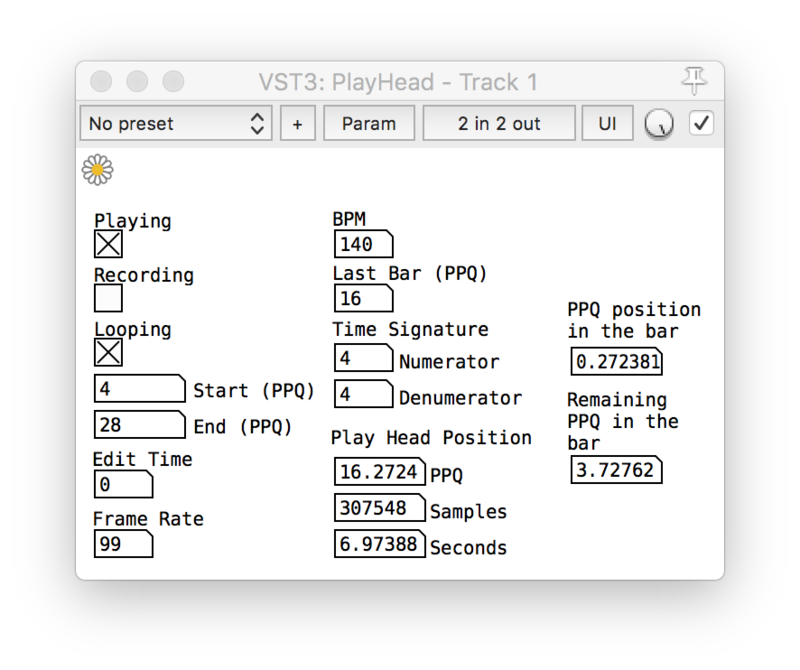 Parameters are used to record and play automations, save and recall presets, and so on. Thus, the parameters are part of the protocol that allows digital audio workstations to control the plugin engine in a real time context. The use of the parameters first requires defining them and then creating the communication system in the patch to interact with the digital audio workstations via the plugin. Important: Digital audio workstations only support the addition or deletion of parameters at the end of the parameter lists. Inserting or deleting parameters in the middle of the list breaks the compatibility of automations and presets. By default, a parameter is just a value between 0 and1. A set of optional arguments can be used after the param entry to define several aspects of their properties using options. name followed by a string of characters defines the name, for example -name Frequency. label followed by a string of characters defines the label, for example -name Hertz. min followed by a number defines the minimum value, for example -min 20 (the default is -min 0). max followed by a number defines the maximum value, for example -max 44100 (the default is -max 1). default followed by a number defines the default value, for example -default 220 (the default is the minimum value). nsteps followed by a number defines the number of step between the minimum and the maximum values, for example a switch has two steps -nsteps 2 (the default is -nsteps 0for continuous values). auto followed by a boolean value defines if the parameter is automatable, for example -auto false, (the default is -auto true). meta followed by a boolean value defines if the parameter is meta-parameter (if it controls other parameters), for example -meta true, (the default is -meta false). list followed by a list of strings of characters enable the list mode of the parameter. The graphical interface no longer displays number but the elements of the list depending on the current value of the parameter. With the list mode, the minimum value is zero, the maximum value is the number of elements in the list minus one and the number of steps is the number of elements in the list (thus these options are no more supported). The elements of the list are separated by slash /, for example -list Triangular/Sawtooth/Square. Changing the parameter values from the patch is essentially useful when using dedicated graphical interfaces. Refer to this section to understand how to set up this mechanism. Most digital audio workstations offer the ability to save plugin states in the form of presets, called programs, which can then be reloaded. The various plugin formats offer methods allowing the plugin on the one hand, to save in a file all the data necessary for the recall of a state and on the other hand, to recover this data from a file . These methods are usually also used when recording and opening a project. Basically, the plugin automatically saves the current value of each parameter when writing the file and retrieves these values when reading the file. It is also possible to save and read additional data that can not be represented by parameters such as the contents of an audio buffer for example or simply text. When saving a program, the plugin sends a message bang to the patch via the object [receive save]. When receiving this notification in the patch, send a list starting with the symbol [save ...( to the object [send camomile] to save the arguments of the list as additional data in the program. Several lists can be sent to save distinct data. When loading a program, the plugin sends back the additional data as lists of messages via the object [receive load]. If several messages have been saved within the program, all these messages will be returned successively in the same order. 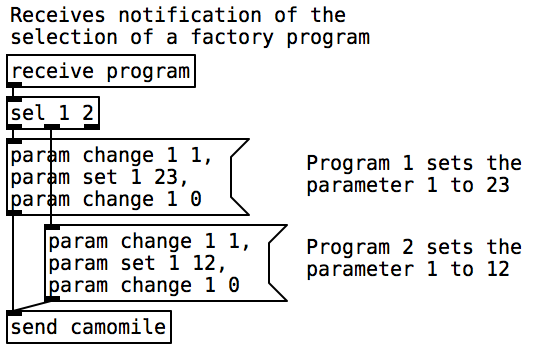 It is possible to ignore the saving of the parameters within a program by setting the entry autoprogram tofalse (default is autoprogram true). In this case, if necessary, saving and reading parameters' values should be done manually during the saving and reading of additional data. The VST3 plugin format does not support factory programs. However, most digital audio workstations offer the ability to save programs to files. So just provide these files with the distribution of your plugin. 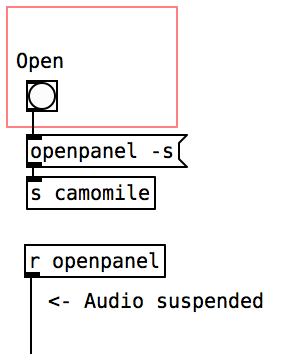 From the patch, send the message [openpanel( or [savepanel( to the plugin via the object [send camomile]. 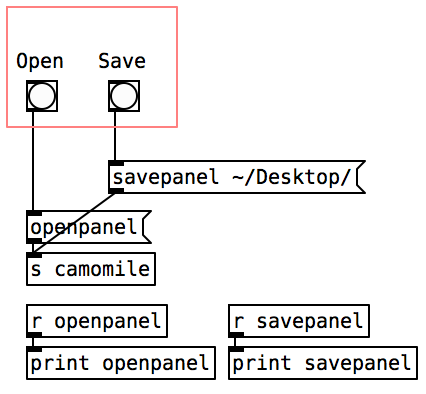 The plugin will show a dialog window and once a file has been selected, it will send back a message containing the path of the file selected that can be received via respectively the objects [receive openpanel] and [receive savepanel]. In the message, you can use an optional argument to use a default path, for example [openpanel ~/Desktop/(. Here is an example: patch. A small patching trick can be used to route the path received depending on which graphical object is clicked. These can be useful if the openpanel or savepanel functionalities must be used for several purposes, for example to load several sound files. Here is an example: patch. Important: Loading or saving a file from or to your hard drive is time expensive and the operation can generate crackles and glitches and even crashes because audio doesn't wait! To avoid such problem, you should use the flag -s in the message sent to camomile to suspend the processing when the plugin send back the results: [openpanel -s( or [savepanel -s(. Here is an example: patch. After changing the size of the visible area the patch, you can notify the plugin to resize the graphical interface by sending the messages [gui resize( via the symbol camomile. The operation will also redraw all the content of the graphical interface. If you just want to redraw the graphical interface because the margins of the patch changes, the objects changed or whatever, you can use the [gui redraw( via the symbol camomile. The future version 1.0.4 will allow to dynamically reload the patch. As explained previously, some characteristics of the plugin can be changed after the the loading like the audio configurations supported, the parameters, etc. But as all these static characteristics are defined in the text file, nothing prevent to dynamically reload the patch. To do so, you only have to click on the fourth icon of the console (and now the console uses the icons set created by Gregor Cresnar because they are simple and pretty while mine were complicated and ugly). The patch can also be reloaded automatically each time you save it - each time the operating system assumes that the patch has been modified - by adding the entry autoreload to truein the text file. This feature can slow a bit the plugin so don't forget to set the value to false (or to remove the line) when you don't need it and especially when the plugin is ready to be released. 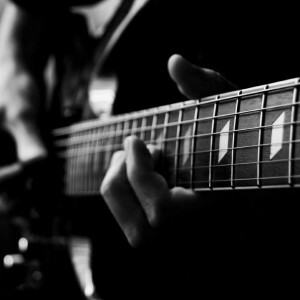 type defines the type of plugin effect or instrument. It is important because the user must know which binary to use to generate the plugin. If the binary used is different from the type defined in the text, you will receive a warning in the console. code is a 4 character string with at least 1 upper case used by the DAW to identify the plugin. It must be unique per plugin. compatibility must be the version of the plugin with which the patch has been created (for example v1.0.2). The plugin uses this to ensure that its compatibility with the patch. If the version of the plugin is inferior to the compatibility version then plugin posts a warning. midiin defines if the plugin accepts MIDI events, it must be true or false. It can be used for effect and instrument plugin. midiout defines if the plugin generates MIDI events, it must be true or false. It can be used for effect and instrument plugin. midionly defines if the plugin generates and receives only MIDI events without audio, it must be true or false. It can be used for effect and instrument plugin. playhead defines if the plugin wants the play head informations, it must be true or false. It can be used for effect and instrument plugin. key defines if the plugin wants to receive key event via the objects key, keyup and keyname, it must be true or false. 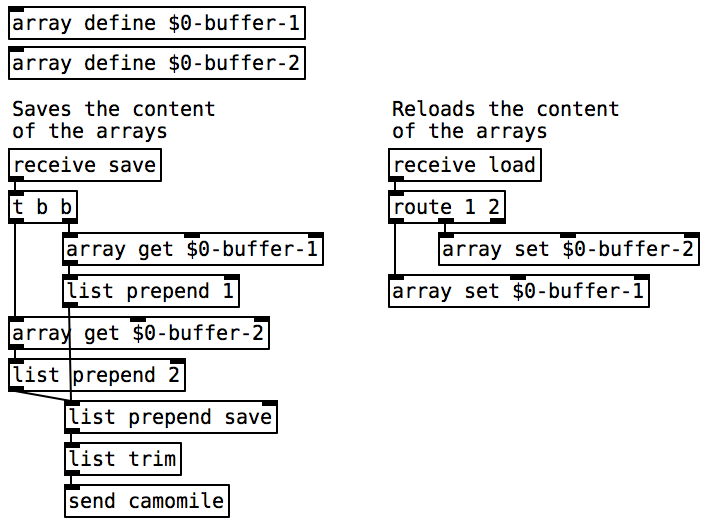 latency defines the latency of the plugin is samples (can also be changed dynamically). taillength defines the tail length of the plugin is seconds. program defines a new program (preset) for the plugin and must be followed the name of the program. For example program zozo. The order of the programs corresponds to their order in the text file from top to bottom. param defines a new parameter for the plugin and can be followed by a set of optional arguments. The arguments can be the name -name, the label -label, the minimum value -min, the maximum value -max, the default value -default, the number of steps -nsteps, if the parameter is automatable -auto (it's true by default), if the parameter is a meta parameter (if it controls other parameters, false by default) -meta. If you want to create a parameter that displays a list of possible values for a waveform for example you can use the argument -list where all possible values are escaped with /. In this case, the minimum is 0, the maximum is the number of elements in the list minus one and the number of steps is the number of elements in the list (if you set one of these options with the list option you will receive a warning in the console). So here are two examples:param -name Frequency -label Hz -min 0 -max 5000 -default 500; for a "numeric parameter" or param -name Waveform -list Triangular/Sawtooth/Square; for a "list parameter". image can be the name of an image file (for example myimage.png). The plugin displays the image as the background of the graphical interface. 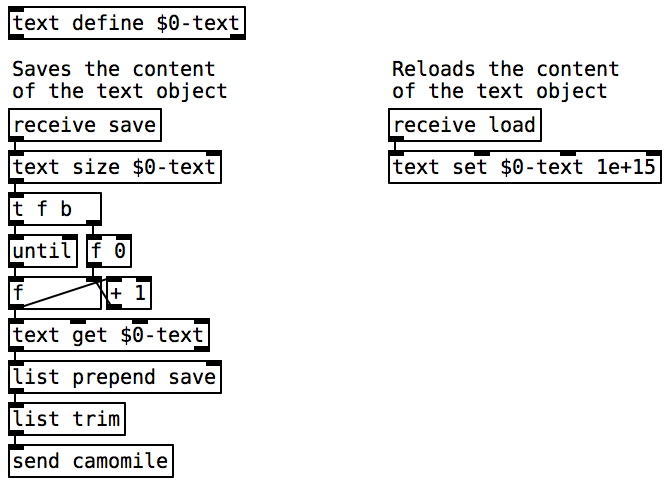 description can be a short sentence (for example A chorus effect) or the name of a text file (for example Infos.txt). The plugin displays the text in the second tab of the auxiliary window. The text can be used to describe what the plugin does and how to use it but also the author, the credits and the version. WIDER TAKES THE MASSIVELY POPULAR STEREO SECTION FROM ITS SIBLING, MANIPULATOR, AND GIVES ANY USER THE ABILITY TO EXPAND THEIR STEREO IMAGE OF ANY SIGNAL TO AN AWE-INSPIRING AMOUNT OF WIDTH. HOWEVER, WIDER IS A UNIQUE STEREO PLUGIN IN THE SENSE THAT IT IS COMPLETELY “MONO-COMPATIBLE”, MEANING THAT ANY SIGNAL THAT HAS BEEN EXTENDED WILL ALWAYS REMAIN IN PHASE WITH ITSELF, EVEN IF SUMMED TO MONO. WIDER IS AVAILABLE IN VST, AU, AND AAX FORMATS, AND IS COMPATIBLE WITH IN 32- OR 64-BIT INSTANCES ON MAC AND PC. DOWNLOAD IT NOW AT POLYVERSEMUSIC.COM/PRODUCTS/WIDER. 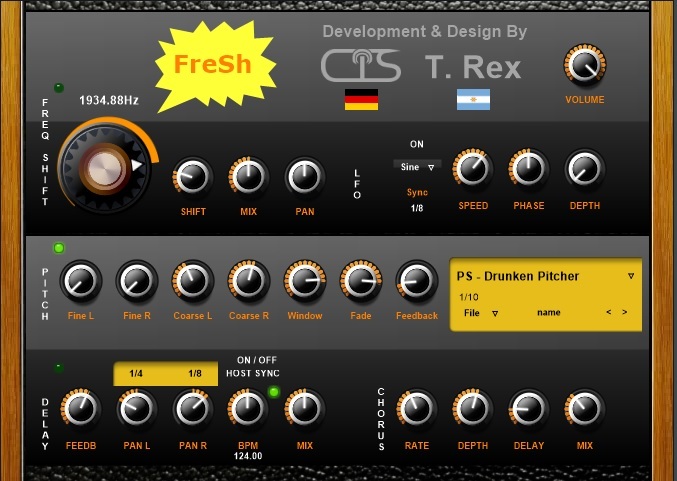 Noizefield and Max Project have announced the release of FreSh, a Frequency Shifter VST plug-in for Windows which you can download for free. From subtle to extreme modulations, this tool can create interesting effects. Okay that might be a bit dramatic, we’re not actually leaving! We’ve changed our name, our image and we’ve partnered with some of the biggest engineers in the world to bring you their tones. Our new name is Lancaster Audio. Rob Rosen & Alex Nasla are proud to announce our new venture with producers Warren Huart & Glenn Fricker. We’re going to be keeping in touch with you via [email protected] so when you see an email from Lancaster Audio, you’ll know that it’s us! In celebration of this change we’re giving you a free gift! First thing’s first though, make sure you follow our new Facebook page! For the next few days you can get your hands on the Rosen Fire Custom IR for free! Use the discount code ROSENOGCREW when checking out to get them for free. We'd also like to give you a 25% OFF Discount code to use on ANY PRODUCT on the site. Use "ROSENORIGINAL" To get 25% OFF on everything! 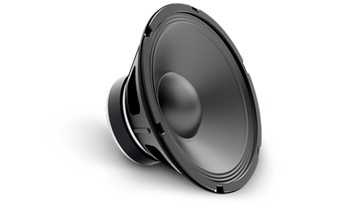 The next email you’ll get from us will be from Lancaster Audio. Thank you for purchasing Impulse Responses (IR’s) from Lancaster Audio! Inside the .zip le this document was found in, you will nd many folders containing the les you purchased. Each folder serves a speci c purpose. This manual will guide and navigate you to gure out which le set is right for your needs. WAV: This is your defacto go-to directory. These les work seamlessly with our own free cross platform IR loader PULSE as well as some other IR loaders. These les are at sample rate 96k, and no matter what your session is clocked at, our IR loader and some others will do realtime sample rate conversion (RTSRC) for high delity tone. S-Gear & Others: This folder contains the IR les in all common sample rates for us in S-Gear as well as other IR loaders that do not do accurate RTSRC. Axe-FX: Files used to convert our IR’s for use in the Fractal Axe-FX line of products. 1. Add the IR’s you purchased to the impulse response folder. If you don’t have one, now is a great time to make one. 2. Insert an amp simulator into your insert chain in your DAW. If the plugin already has a built in cab-simulator, go ahead and bypass it. 4. Point the IR loader to the impulse response you wish to load. Read above to nd out which folder is right for your needs. 5. Enjoy. We use Apogee converters and an assortment of mics, and pres depending on the cabinet we are capturing. These include common options such as an SM-57, MD421, ribbon mics from AEA and Royer, and condenser mics from many companies. Pre’s include Apogee, API, Neve, SSL, and True Systems. Our IR packages contain 3, 6 or more variations depending on when the IR was captured and a few other factors. Su x A and B denote the power amp that was used. Both are tube amps. Positions 1/2/3 denote either a di erent mic position or a di erent microphone. IR’s do not contain any post processing unless it’s a custom hybrid cab. We much prefer to get real cabs and adjust the mic position. The wildlife of the skies represents itself with calling, chirping, shrieking, cawing, screeching, growling and other unique bird voices. Whether aggressive or social, anxious or relaxed, melodic or irregular – get ready for a concert of the remarkable! 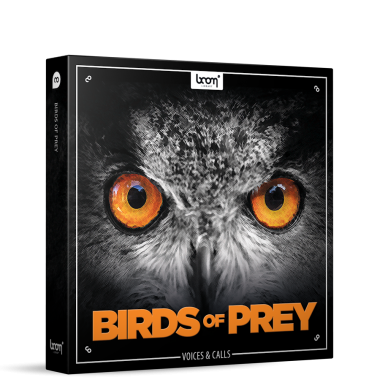 A sound collection full of extraordinary flying raptors: buzzards, cranes, eagles, falcons, goshawks, vultures, owls and more. Enjoy! 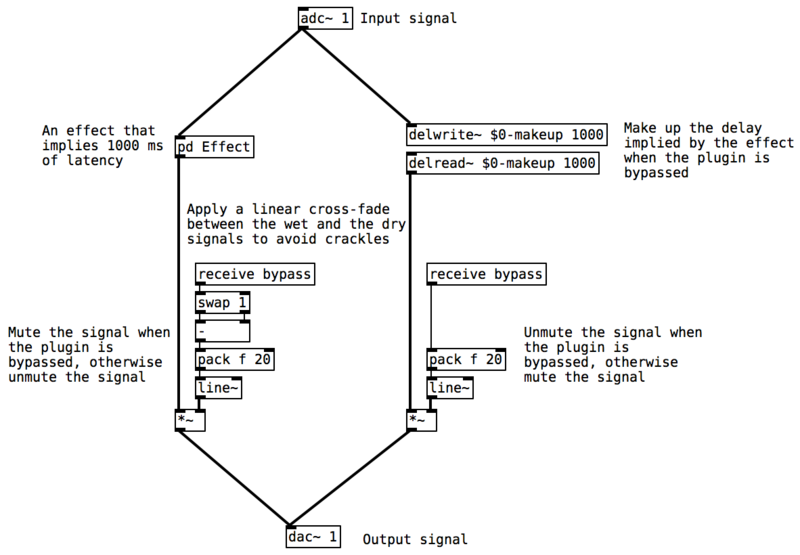 SampleDelay is a plugin that simply applies a short delay to a track. It has a precision at the level of one sample. It is more designed to be used as a utility than to be used to make an effect. Gain60 is a plugin that modifies the gain of a track from -60dB to +60dB. Increase the level of a track that was recorded with a very low level. Sometimes on this kind of track we do not even see the waveform. 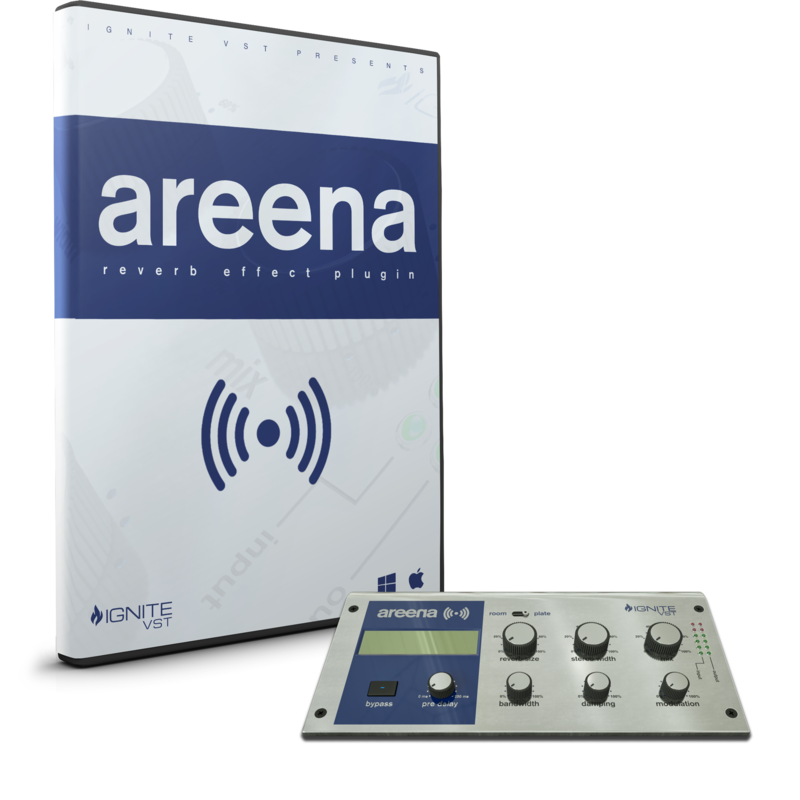 The plugin can then be used in “offline” mode (bounce…) to increase in one step the gain of the whole track. Colour Copy public beta is now available. u-he Colour Copy - public beta! 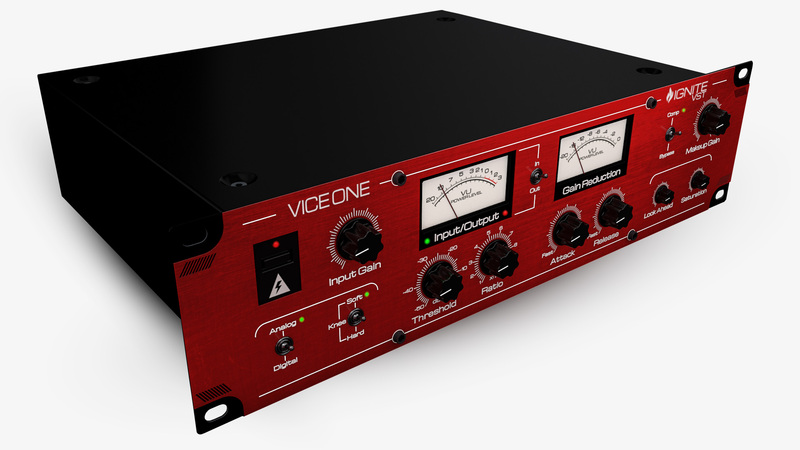 A virtual analog effect inspired by classic bucket-brigade delays (BBD), but extended with modern features. We called our new baby "Colour Copy" because it can deliver the kind of colouration people still love in classic BBD units, but with a wider variety of colours. In normal digital delays (DDL) the delay time alters the size of the buffer. If you quickly modulate or sweep the delay time on a typical DDL, unmusical glitches propagate through the feedback as the buffer is shortened or lengthened. Like a real BBD, Colour Copy changes the internal samplerate instead (i.e. how fast the "buckets" pass on their content), and this is why Colour Copy is smooth with a capital SMOO! It *is* a beta... use at your own risk. Don't install just yet if you're in the middle of an important project. If you do install, consider making a backup first. Also: We don't have any factory presets for Colour Copy yet - feel free to discover uncharted sonic territory! We are aiming for an August release. * The routing is quite flexible – you can swap input channels or mix them into either channel, and the feedback can be cross-fed, inverted (especially good for flanger effects) or mixed in for subtle phase cancellations. Cool feature: In most delays with cross channel feedback, the first delay appears on the same side as the original signal. In Colour Copy you can set up "double cross" routing so that the very first delay is on the opposite side. * Unlike hardware BBD units, Colour Copy lets you position the left and right tap positions. This lets you move echos independently "forward in time" for e.g. ping-pong or "rushing" delays as well as various stereo chorus or flanger effects. * In the Feedback Colouration section you can blend between five different "colours" ranging from resonating and gritty to very dark and slowly evolving. These characteristics can also be modified further via the Brightness and Saturation controls. * The Modulation section lets you modulate the delay rate, tap positions or delay amplitude to create various animated effects. * The Ducking section lets you automatically suppress the feedback level (the first delay is not affected) according to the dry signal level. This unusual method preserves the spacial effect much better than regular ducking, which removes what the delay was intended to create! * The Freeze button causes the contents of the delay line to play indefinitely – the sound will loop smoothly until you unlatch the button. * The Note Sync button lets you control the delay rate via MIDI note number and pitch bend. As the Colour Copy delay times extend down into the milliseconds range, you can even use this to "play" pitched resonant effects from a keyboard or MIDI track. * Full NKS FX compatibility (in the release version only, not in this beta). Note: The promo code from our Newsletter Special won't work for Colour Copy yet - you would have to wait for the final release. However, the Colour Copy introductory offer is cheaper anyway, so you can save that promo code for something else! including RMS, EBUR128 and TruePeak measurement. It is the successor of the very popular dpMeter2 and adds free GUI resizing and preset management. Select your system and download instantly. our algorithmic reverb featuring plate and room algorithms. Plate emulates the sound of real hardware plate reverbs, while room was designed to emulate a small room. Pre-Delay: The amount of time between the original dry sound, and the audible onset of early reflections and reverb tail. Bandwidth: Limit the frequencies entering the reverb. Damping: Control the rate at which higher frequencies fade from the reverb. Modulation: Simulates the walls of the room moving at a set frequency. Two reverb algorithms to choose from, plate and room. Stereo Width: Make the reverb sound more stereo or more mono. SCALE: The Plugin is resizable, drag the bottom right corner to change the size of the plugin. Select your your system and download instantly. Analog/Digital: Analog mode changes the response of the attack/release and soft knee mimicking a tube compressor. Analog mode also adds extra colouration to the sound that is dependant on the input gain. Digital mode has a faster response and less colouration. Soft/Hard Knee: A soft knee begins to compress the signal gradually around the threshold, while a hard knee will compress as soon as the signal reaches the threshold. Input Gain: Increase the signal level before the compression. Threshold: Level at which the compression will start. Ratio: The amount of attenuation to be applied from the threshold. VU Meters: Input/Output meter gives the level in decibels for the input(non-compressed) and output (compressed) signals. The Gain reduction meter shows how much the signal is being reduced by. Attack: Attack is the time it takes the signal to become fully compressed. Release: Release is the time it takes to go back to a non-compressed signal. Look Ahead: This delays the input signal. This gives the compressor more time to react, ensuring no peaks go above the threshold. Useful for limiting. Saturation: Adds more ‘colour’ to the signal. Makeup Gain: Boost the output level after the compression. This UNOFFICIAL Port Turns VCV Rack Into A VST Plugin! You can now use the VCV Rack open-source modular synthesizer as a VST plugin in your favorite digital audio workstation thanks to this unofficial port by KVR user bsp804. 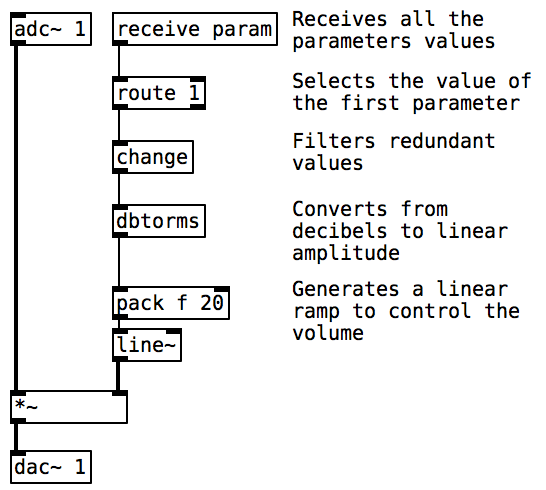 VCV Rack is an open-source modular virtual synthesizer which was introduced in September last year. It is an amazing virtual modular synthesizer with a growing library of custom modules, thanks to the fact that it is open source. Unfortunately, it only operates as a standalone application and can’t be used as an instrument plugin inside a DAW. Although it is possible to connect VCV Rack as a virtual effect thanks to the recently released VCV Bridge, it still can’t be used as a regular VST instrument. Until now, that is! Want more free content? Subscribe to BPB and receive freebies every week! Thanks to an unofficial port that is currently being developed by KVR Audio forum member bsp804, users can now load and use VCV Rack in their DAW of choice just like any other virtual instrument. It is important to note, though, that this port is not in any way associated with VCV Rack’s author. It is an unofficial third-party port which is still a work in progress. For what it’s worth, I tested it in MuLab and Studio One without any issues. The provided DLL file loads like any other VST plugin and shows the VCV Rack user interface inside the DAW. The functionality is completely the same as in the free version. 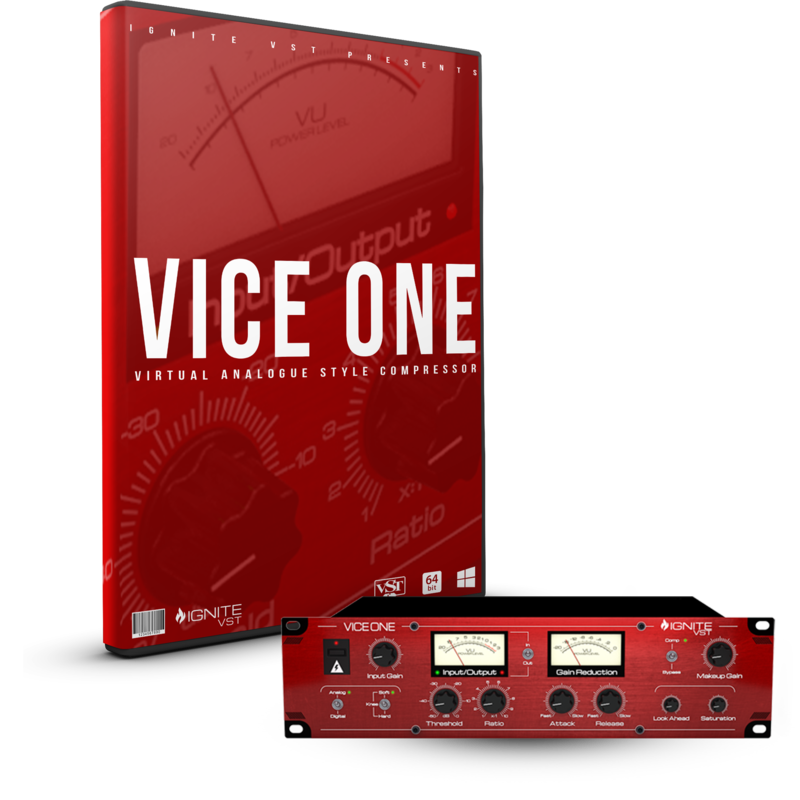 As a bonus, the plugin is conveniently bundled with a bunch of custom VCV Rack modules which are available for free download. You don’t have to install any additional modules or extensions since everything is already included in the download pack. Neat! The port is only compatible with 64-bit VST plugin hosts on Windows at the moment. Follow the forum thread at KVR Audio for more info about the project and grab the latest version of the software from the GitHub page linked below. Before you go, a friendly warning – if you’ve never used VCV Rack before, do consider lowering the volume of your speakers while learning the ins and outs of the software. You’ll need to make quite a few virtual cable connections before you finally get some sounds out of the plugin, so make sure that your monitor level is low to avoid any nasty noise bursts and potential damage. The VST Plugin port of VCV Rack (unofficial) is available for free download via GitHub (48.1 MB download size, RAR archive, 64-bit VST plugin format for Windows).